oilve oil | Let There Be Food! Until recently, I thought everyone knew about roasted garlic. I’ve seen other bloggers post about roasting garlic and read through their posts to make sure I wasn’t missing anything. Nope. We’ve all got it, so why are we continuing to post about it? 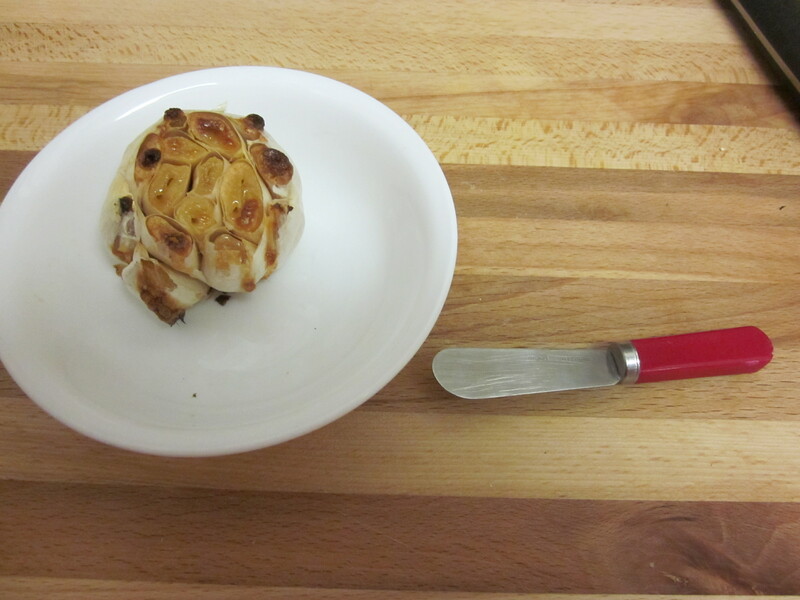 Why am I here adding to the blogosphere with another roasted garlic post? Well, my friends, I’ve learned that not everyone knows what roasted garlic is or that they can make it themselves to avoid paying $8 for it at a restaurant. That is quite possibly one of the biggest restaurant mark-ups out there I’ve ever seen. So sweet food lovers, I’m happy to share with you the various ways I’ve made roasted garlic, what I do with it, and why I encourage you to make it at home instead of eating it out. 2. 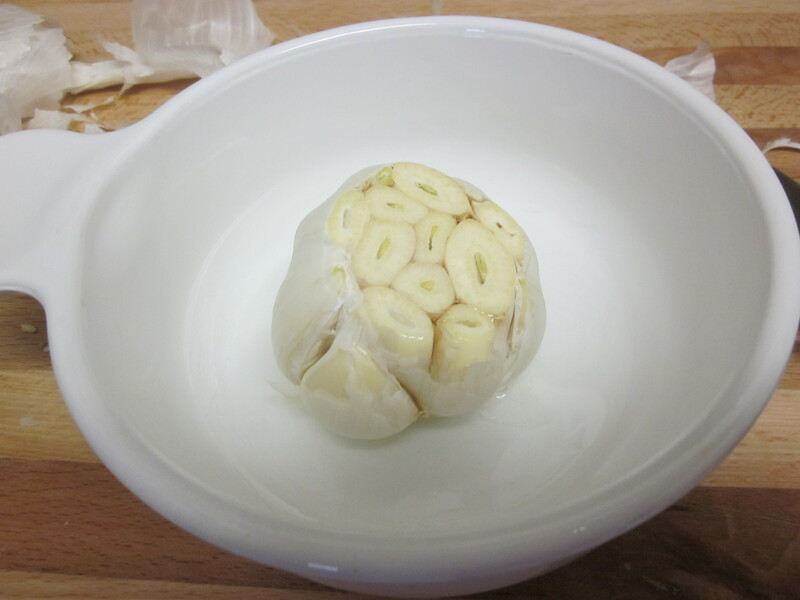 Slice off the top third of the head of garlic, and peel off a few of the extra layers of the papery skin. Leave the last layer or two. You won’t need the top third for the recipe. We’ll talk about what to do with it later. 4. Drizzle the teaspoon of olive oil over the top of the head of garlic. 5. Cover the dish and put in the oven for 45 minutes. 6. 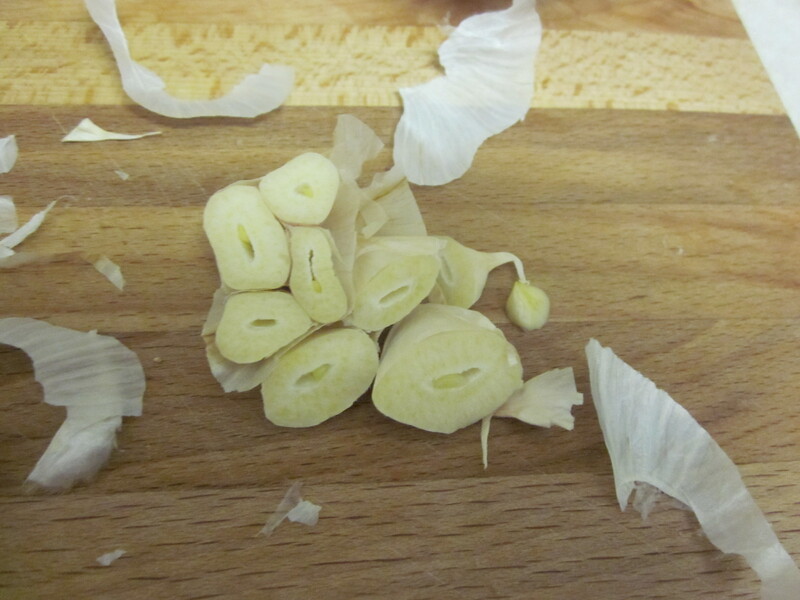 Check garlic to see if the cloves are soft and if it’s starting to turn brown. It might need another 10 – 15 minutes. Your goal is soft, brown, and a little bit caramelized around a few of the edges. 7. When you take it out of the oven, let it rest for a few minutes so that it burns neither your mouth nor your hands. *Alternatively, you can wrap your bulb of garlic in a piece of foil so it’s a snug little bundle. If you go this route, omit the tablespoon of water, and just go with the teaspoon of oil. I’ve also used this method. I like it as it reduces the number of dishes you have to wash. The dish/water method seems to keep the garlic from over-browning and reduces waste. It’s your kitchen so you can make the call for your preferred method. 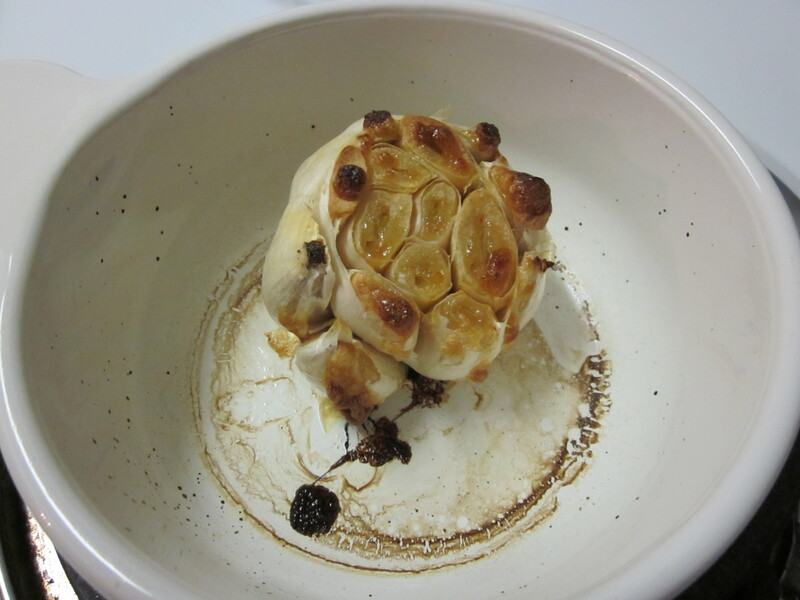 The water will evaporate throughout the cooking, and it will get brown in the bottom of your dish, but don’t freak out. This will wash off. There have been times when I have wanted a few cloves of roasted garlic but didn’t want to roast an entire bulb of garlic. In these cases, I will take a few individual cloves of garlic, leave them wrapped in the skin, bundle them in a piece of foil with just a dollop of light olive oil and cook them in the oven along with whatever I’m baking or during my preparations for the rest of my dinner. As it usually takes me 35 – 40 minutes to make dinner, this is just about the right amount of time to roast the individual cloves. Again, you are looking for the cloves to be soft and browning at the ends. They might be oozing a little bit too; this is a sign of done-ness. For this to happen, your oven needs to be at least 350 degrees. If it’s higher, you should check on the cloves starting around the 25-minute mark. When you chop off the top third, you are left with a decision. 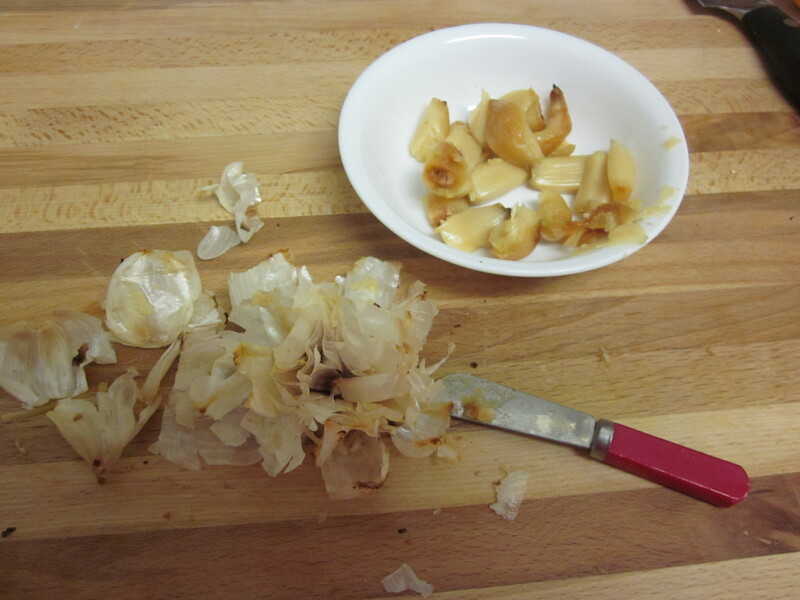 Many folks just toss it because it’s full of tiny little pieces of garlic that are difficult to do anything with. If you are like me, or have a grandmother like mine who has greatly influenced you, perhaps you feel badly wasting anything including tips and pieces of garlic. I tried once roasting the top third with the rest, but that didn’t end well, so I don’t recommend it. But you could mince it up to go into your meal, or save it to mince later. Just remember to mince it soon as the cut pieces don’t save for too terribly long. It’s also okay if you just throw it away. It’s your kitchen and nobody will know. There is so much you can do with roasted garlic. As one of my dear girlfriends has said, you can start with smearing it on your face and go from there. It is that good. The last time I made it, I took all the cloves out of the head of garlic to put into an aioli. I’ve put roasted garlic on toast, then topped it with cheese or tapenade or bruschetta. I like to put roasted garlic in mashed potatoes or mixed in my baked potatoes. You can smush it through a garlic press into pasta, soup, omelets, or anything else that strikes your fancy. Because roasted garlic has a much more mellow flavor than raw garlic as well as being so spreadable, it can be used as a good substitute for butter. 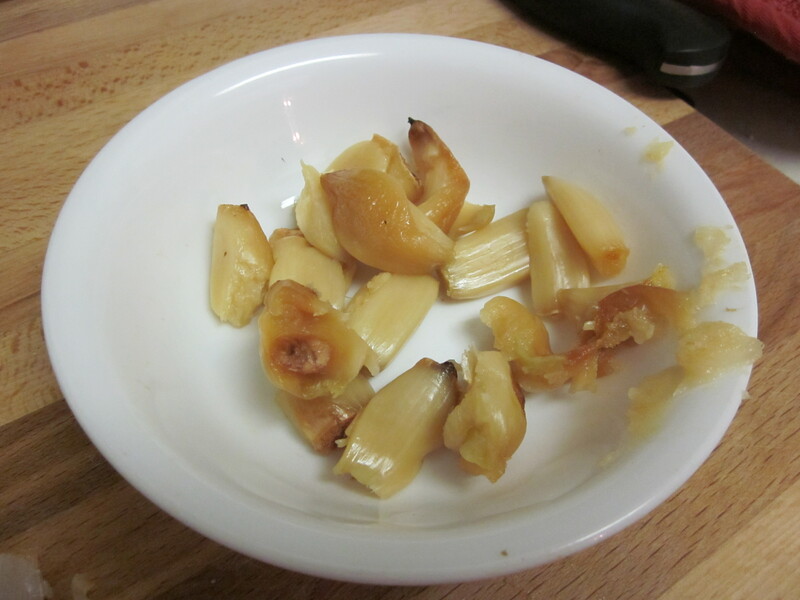 When I was eating my gallbladder low-fat diet last year, I did a lot of roasted garlic-substituting. I did try once leaving out the oil, but it didn’t roast quite as well. The oil helps its spreadability as well the browning of the garlic. 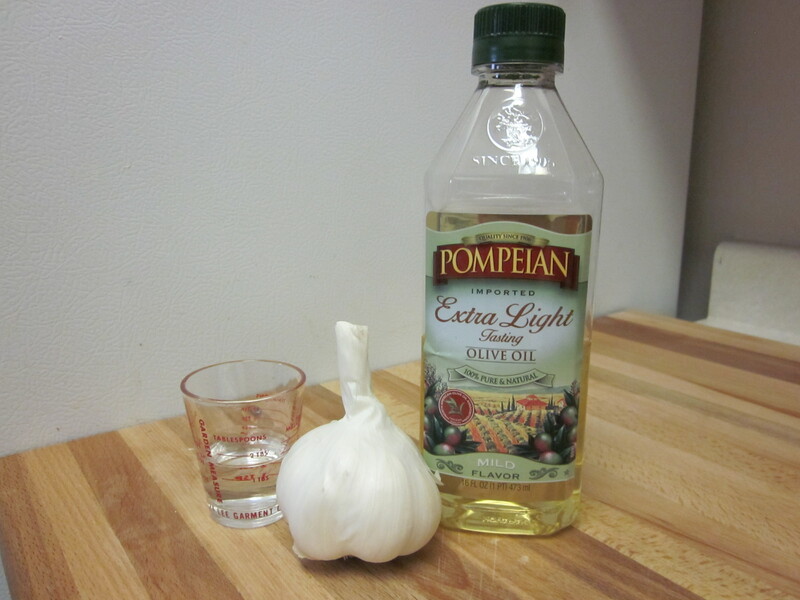 Without the oil, the garlic is sort of a pale, anemic color and is difficult to spread. I got all the cloves out! 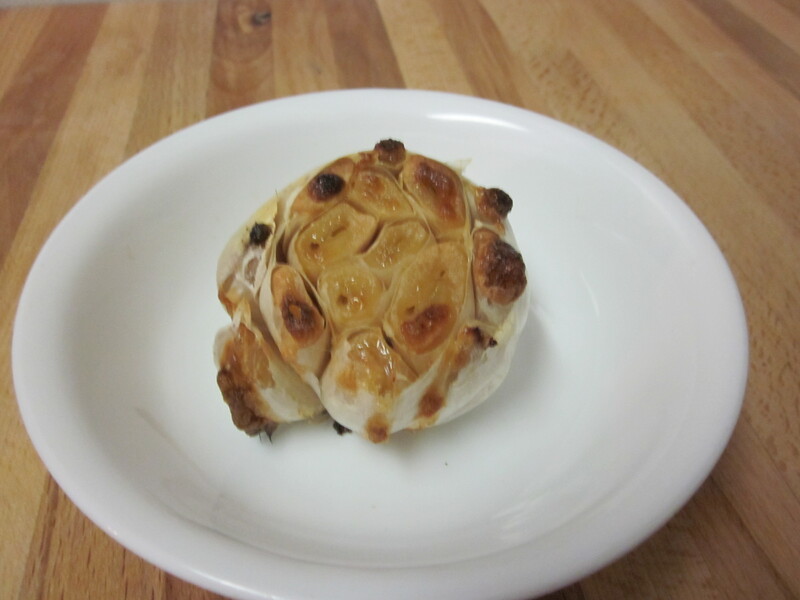 Let’s talk about why I believe you should never order the roasted garlic appetizer in a restaurant. At the grocery store, garlic can be 2 for $1.00 or for a real deal, 4 for $1.00. I cannot think of a time when I’ve seen it be more expensive than $0.50 for a head of garlic. Most of us have a bottle of olive oil in our house. Yes, I want to encourage you to use light olive oil which may require owning 2 bottles, but regular olive oil could suffice if you just wanted to have the one. But once you’ve purchased the one bottle of oil for likely somewhere between $5 and $9, depending on brand preference, you can have so many heads of roasted garlic out of that bottle for the price of one appetizer of roasted garlic from your local eatery. There is a fancy-pants restaurant here in Austin where you can order roasted garlic bulbs with toast points for $8.95. I do vaguely recall they are generous enough to give you two bulbs. Even so, at approximately $4.50 for a bulb with a couple of pieces of toast, it’s not a great deal. Y’all, make this at home. Take your $8.95, get two bulbs, a loaf of French bread, some yummy cheese, maybe some tasty meats or olives, and make a full spread of it. I like to do this regularly, and I highly recommend it. The reason why I encourage you to use light olive oil over extra virgin olive oil for roasting your garlic is because I have read that the smoke points for the different kinds of olive oil vary with the smoke point for light olive oil being higher than extra virgin. Bad things happen to oil when it reaches the smoke point. First, the oil begins to break down and create free radicals which are bad for your body. However, they are not nearly as bad as flames in your oven, which is the other concern of oil reaching the smoke point. The smoke point isn’t too far from the flash point where the oil could break into flames. Danger, Will Robinson, danger. At the same time, there is A LOT of data out there on the various smoke points for oils, and they don’t all say the same information. This website is all about olive oil and has good information about smoke points so you can educate yourself to make your own decision. One blogger doesn’t even recommend using olive oil anymore; you can read about that and using ghee instead, if you like. Spread the good word about roasted garlic, y’all. I’ve learned that too many of my dear friends have never eaten it or don’t know how to make it at home. It’s just not right. We shouldn’t be paying $9 for it at restaurants. We can roast our own garlic to use in a plethora of ways! It even keeps in the fridge for about a week if you want to spread out using it. We have options and they are delicious! But do spread the good word so that others can know the joy of roasted garlic. Happy eating!